The Sagittarius and Cancer in love will both need to have patience. They will both need to give the relationship time to develop and mature. The longer they are together, the more they will both realize that they have a lot to offer each other. It might seem like Sagittarius is just a thrill seeker who enjoys an occasional adrenaline rush. They will need to learn to appreciate the strong emotional encouragement the Cancerian can give them the longer they are together. It might seem that Cancer will have more satisfaction from having emotional security. After the Sagittarius Cancer relationship is established, the crab might want more of a commitment than the archer will be willing to give. Sagittarius is a Fire sign. The archer wants independence. Cancer is a Water sign. The crab wants emotional security and stability. Their basic needs affect the way they look at life. Their needs affect the way they look at projects and relationships. They might not always be able to see where each other is coming from. 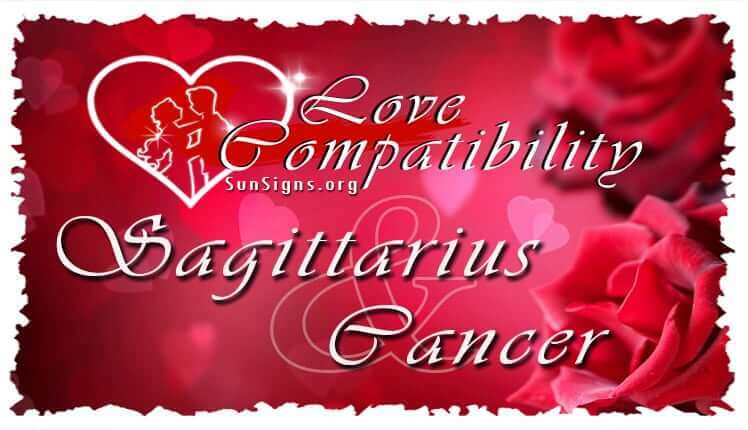 But their energies will complement each other in this Sagittarius Cancer love compatibility. Because of this, the Sagittarius Cancer soul mates will have an electric connection and they will be able to accomplish different things. They will both need to recognize the importance of their intimate bond. They will both need to value the Sagittarius Cancer friendship and respect each other’s opinions. If they can do this, they can usually take care of their arguments. Sagittarius is a Mutable sign and Cancer is a Cardinal sign. The archer will jump from idea to idea and adventure to adventure based on how they are feeling. The crab will be the one to start new plans. The crab will need to give the archer the independence they need to explore their own space and interests outside of the relationship. The Cancer personality can help bring Sagittarius’ ideas to life. The archer might lose interest in them and move on, but this will not stop the crab. The Sagittarius personality can teach the Cancerian the importance of an open mind instead of being continually determined with a lack of flexibility. The best thing about Sagittarius and Cancer love compatibility in a romantic relationship is that they can both give each other security. Sagittarius will need their freedom to be able to give that security. They will be compatible when they open up to each other. They will need to accept each other’s opinions as being valid. They will need to have open and clear communication. They will need to appreciate and respect each other’s differences. If they can do this, the Sagittarius dating Cancer will have a stable and happy relationship. If the Sagittarius Cancer compatibility is successful, it can become very encouraging for both of them the longer they are together. They can both learn a lot from each other. The Sagittarian can learn the value of deep emotions. They can teach their partner to be more daring. The Cancerian can add a smart note of caution to some of archer’s wilder ideas. They will be able to learn to lighten up and stop worrying so much. If the Sagittarius Cancer marriage is balanced, they can have a truce if they need to. They can be more compatible with each other if they give each other the space they need. Their horoscope compatibility might grow stronger when they are apart. However, the crab will not like being separated from their partner. Sagittarius and Cancer in love have different ways of looking at life. Cancer thrives on emotion and tradition. Sagittarius is more like a restless traveler. The crab’s emotional nature can be hard and overwhelming for the archer to accept. The crab will likely not want to accept that the archer is restless and will want activities outside of the relationship. The Cancer born will be able to give Sagittarius a stable home base. The archer will be able to keep their dreams and motivations in perspective at home. The archer’s free spirit will give the crab’s daily life some variation and excitement. The planet Jupiter rules over Sagittarius. The moon rules over Cancer. Jupiter is concerned with philosophy and the moon is concerned with emotions. The moon is about love, being nurturing, and the maternal instinct. Jupiter concentrates on expansion, optimism, luck and travel. Sagittarius and Cancer in bed together can be a combination of growth and expansion and male and female energy. They will both be able to sustain each other. If they are working towards a common goal, they will have a good effect if they combine their sexual energies. Sagittarius and Cancer relationship might not have a strong love compatibility. At the same time, their relationship will be steamy and intense for a short time. They could have a relationship that will burn brightly for a while. Eventually, Sagittarius’ fire will boil away Cancer’s emotions. However, the crab’s water might threaten to extinguish Sagittarius’ excitement. They will both try to change each other and this will make trouble. The crab will be very concerned with home and family life. Their first priority in the relationship will be making a stable home. The archer will not be interested in any of it. They would rather sow their wild oats first. Sagittarius will not mind having Cancer lover with them for their adventures. However, the crab will not want to go. Because of this, the adventurer will be exploring alone. The homemaker will be left at home, waiting and continually wondering when the adventurer will be back. This will be a constant worry and turmoil for the crab. Sagittarius star sign will not be compatible if Cancer tries to take control and limit their independence. Sagittarius and Cancer in love can have a lot of arguments. The crab can be passive aggressive and manipulative when they do not get their own way. The archer will not like this and will be very angry. The archer can be blunt. They lack tact and they can be hurtful. At the same time, they will always be honest and direct. Cancer men or Cancer women can be evasive but this is not good for them being compatible. Sagittarius and Cancer couple will not be able to enjoy a good debate together. They will both have different ways of fighting. Because of this, they will easily become annoyed with each other. Sagittarius and Cancer zodiac signs will not have a lot of malice in their fights. The archer will basically be kind hearted and will mean well. They do not want to hurt the crab. The crab is nice, gentle, and affectionate. They will not want to hurt the archer. However, they might not be able to help it. They will both need a lot of patience and understanding to learn to tolerate each other’s differences. If they can do this, they might be more compatible with each other. However, Sagittarius is not very patient. They might not be able to develop a relationship deep enough to figure out a way to work through their differences resulting in a Sagittarius Cancer breakup. Sagittarius is the adventurer of the zodiac. They will be a traveler and be expansive. Cancer is the homemaker of the zodiac. They have a fundamental nature. They might find it hard to be compatible with each other. Because of this, the Sagittarius Cancer love compatibility might seem too opposite to each other. They will likely continually fight over having security and being daring. The archer and the crab both will have trouble compromising. Sagittarius and Cancer zodiac signs will usually end up going their separate ways. They are usually amiable about it and might even be good friends after.